The six works included herein were originally part of a collection of fourteen released in 1972 on Desto DC 6435/37. The collection was entitled "MUSIC FOR A 20th CENTURY VIOLINIST - An Anthology of Three Decades of American Music, 1940-1950-1960" and constituted a continuation of a concert series that I gave in New York City during season 1968-9. Other works from the original set - by Brant, Cage, Feldman, and Wolpe - may be found on CP2 108; works by Mennin and Sessions are on CP2 113. Two other works have not been re-released. The order of the works in the original LP set were to some extent determined by what could fit on an LP. Having chosen the 6 works for this CD, I was faced with the problem of picking one of the 6! (=720) possible orderings. I spent a fair amount of time trying various orderings, all of which were trying. I finally used I-Ching operations as I wanted to open my mind to a set of possibilities that I clearly was not thinking of. It is amusing that the Shapey and Riegger and the Sollberger and Berger still ended up next to each other as in the original LP set. Furthermore, if you think of each work as a single movement, the almost Mahlerian structure-succession is revelatory. It is my pleasure to acknowledge my colleagues: Gilbert Kalish (the pianist for all works), Allen Blustine, Alvin Brehm, Raymond Desroches, David Jolley, Harvey Sollberger, and Sophie Sollberger. With the exception of the Riegger, the following notes are extracted from the original liner written by the wonderful Nicolas Slonimsky. Shapey has this to say about the philosophical and technical antecedents of his Evocation: "In my music, the initial space-time image generates through expansions of itself all textures and a structural totality. Through permutations of this image I continue, rather than destroy, its state of being... Within a work the initial image will explode into its own various states of being, juxtaposed against itself in ever new focuses. These new states become the new proportions. By extending, contracting, verticalizing, inverting, redeploying, refocusing of the material, the same state of being and its varied phrases can move on diverse time and space differentials." A gorgeous, refined, reserved, and elegant line-drawing. In this work Piston follows the characteristic formula of the Baroque period. Although he had long abandoned explicit key signatures, the tonality here is clearly outlined, the outer movements gravitating towards B flat major, and the inner slow movement to A minor. The texture is contrapuntal and transparent; there are some fine canonic passages. Since the keyboard part is designed for the harpsichord of the Baroque era, the range is kept rigorously within the limits of classical usage. 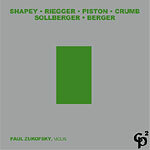 "The work was first performed on February 3, 1965 in Buffalo, by Paul Zukofsky. On this occasion I was the pianist. The music is of the utmost delicacy and the prevailing sense of 'suspension in time' is only briefly interrupted by the animated and rhythmically more forceful second piece. The sustained lyric idea presented at the beginning of the work, the nervous tremolo effects, and the stylized bird songs are all recurrent elements. In composing the Four Nocturnes I had attempted a modification of the traditional treatment of the violin-piano combination by exploiting various timbral resources of the instruments. Thus a certain integration in sound is achieved by requiring both instruments to produce harmonics, pizzicato effects, rapping sounds (on the wood of the violin; on the metal beams of the piano). The gentle rustling sounds which conclude the work are produced by the application of a percussionist's wire brush to the strings of the piano." "I think of Solos as a large single-movement work which divides quite clearly into three main sections. The two outer sections, which together might be heard to form a continuous piece but for the 'interruption,' of the scherzo-like middle section, constitute the bulk of the work. The relation of the violin to the other instruments is fluid and constantly changing, ranging from 1) the violin's assimilation into the ensemble 2) its participation in little chamber music interludes (such as the 'violin and piano sonata,' early in the first section) to 3) traditional solo-tutti confrontations. The work as a whole is bound together by periodic restatements of refrain material which first occurs in the opening measures." Arthur Berger's Duo No. 2 belongs to [his] neo-classical period. It is in two sections, marked "Semplice" and "Moderato Grazioso." The generative rhythm of the opening is in tranquil eighth-notes in 4/4 time. The mood is pastoral, and the writing is in diatonically pure white notes. The music becomes agitated towards the middle, with rapid figures flying across from the violin to the piano part, and back. Then the initial mood returns, and there is a brief formal coda. The second section is in alla breve, with the eighth-notes still being the formative elements. The character is dance-like, suggesting a ballerina in search of a Russian ballet company, meanwhile showing off her expertise in pointes and pirouettes. The cadence is gentle, undisturbed by the dissonant fourth inserted in the tonic of F major. David Jolley, horn; Gilbert Kalish, piano; Harvey Sollberger, conductor; Sophie Sollberger, flute. with Raymond Desroches, percussion; Publisher: Theodore Presser Co. Publisher: Boosey and Hawkes, Inc.
For all works - Gilbert Kalish, piano. All of the above works were recorded at Paul Hall, The Juilliard School, NY in 1971-72. They were engineered by Horace W. Grenell and originally released as part of the Desto set "Music for a 20th Century Violinist" (DC 6435-37). © 2004 Musical Observations, Inc.